With the remote control, you can set any mode if it shuts off automatically after 6 hours of work, and it will work again after 18 hours. The fairy lights are powered by 3 AA batteries. This battery powered fairy lights can be the trouble to find the outlet. The battery compartment is waterproof, do not worry about getting the fairy lights soaked in dew. 【50 LEDs & 18ft】- 50 Warm-white globe string lights. Total length is 18 feet, consist of 50 translucent globes, the diameter of each globe is 0.7 inch and spaced every 3.94 inch. 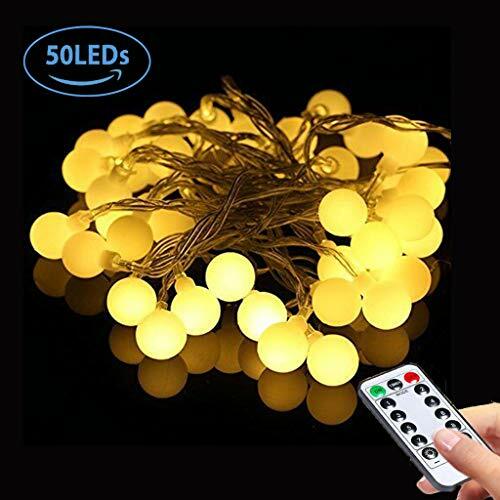 【Remote Control & Battery Case Control】- 2 Switch Modes are available for the led globe string lights, wireless remote control and battery case control. 【Safety & Energy Saving】- This outdoor globe string lights is 3000K color temperature. The ball keeps at a low temperature so they are safe to touch without risk of burns after many hours of use. The LED Starry Lights are safe for children and pets. 【Waterproof & Widely Application】- IP44 Waterproof for globe string lights,available for concerts, clubs and other related Christmas tree, fence, lawn, deck, landscape, roads, islands, garden, bar, terrace, bedroom, wall, windows, Floors, balcony, background, stage.